ANOTHER crazy snow storm here in Western KY less than two weeks from the first one! This time we got somewhere between 17-20" of snow. I decided to pull out the acrylic paints instead of quilting. 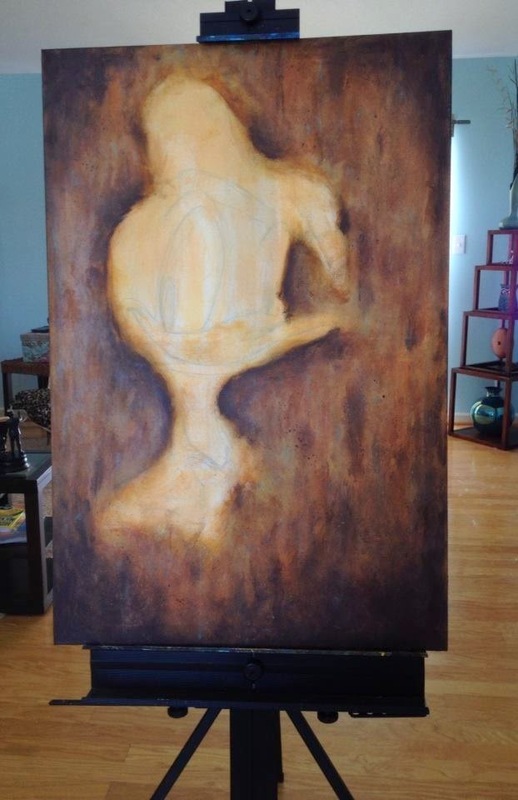 I purchased a big honkin' canvas last week with no idea what to do with it. My brother suggested a Disney themed painting and I was all over that! I thought I'd try Mickey or maybe one of the Disney Dogs...I love them all. 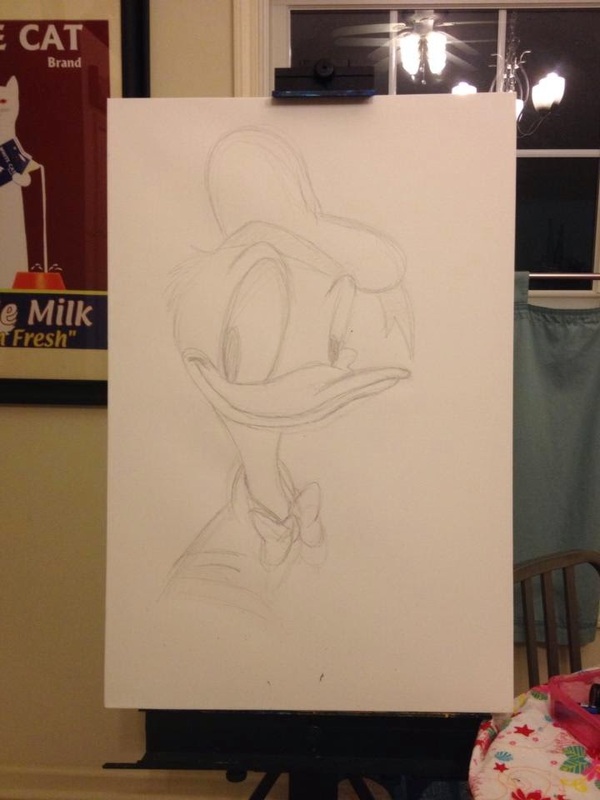 But Donald is my most favorite Disney character and I knew I had to pay homage to my favorite fella with a portrait. I did some searching online and found a some nice line drawings of Donald. 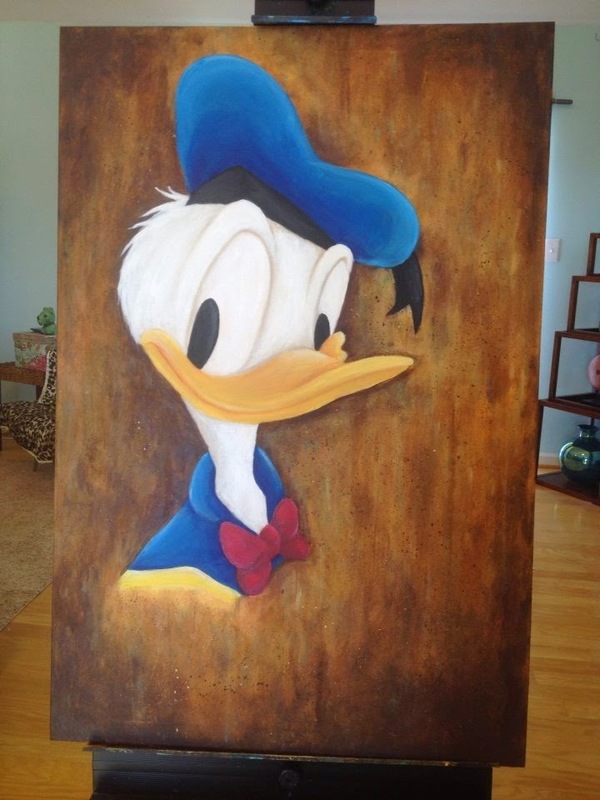 Once I decided on a happy version of Donald, I got that on the canvas and started playing around with the background. I wanted Donald to really stand out, so I went with a dark, more subtle background. It ended up much lighter in the finished piece. Honestly, I spent as much time working on the background as I did Donald! After two days and hours of work, Donald if finally done! And I'm in love. I'm not braggin' I'm just saying this painting makes me very happy. It's awaiting a final coate of matte varnish and then it's going on my living room wall. Thanks for visiting my blog! I'll try not to to embarrass myself while you're here. KY Snow Apocalypse = Bursts of Creativity! Big List of Blogging Chicks!